The Genius feature finds the songs in your music library that go great together and makes a Genius Playlist for you. It’s like having your own highly intelligent, personal DJ. You can flip through your album art with Cover Flow. Or, vertically speaking, see more albums and artists on the screen at one time. They respond to the way you move, so they’re immersive, addictive, and a blast. Your photos look beautiful in their proper aspect ratio on the vibrant, 320-by-240-resolution display. Now you can view your album art in Cover Flow. Or just press and hold the Center button to browse by album or artist. When you find the right song, press the Center button to add it to your on-the-go playlist. Now you can shake to shuffle your music. Just give iPod nano a shake and it shuffles to a different song in your music library. 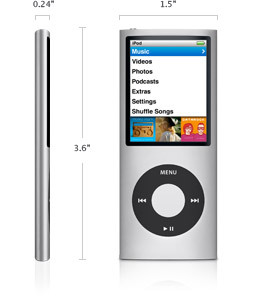 Watching movies, TV shows, and videos is big fun on iPod nano. And the high-resolution picture looks crisp and vivid on the 2-inch widescreen display.